Hands up who’s getting their ears pierced this weekend? The process of getting your ears pierced used to mean sitting awkwardly in the shop window of Claire’s Accessories, only to be shot through the ear lobe with either a standard gold or silver stud. Not so now, thanks to Maria Tash. 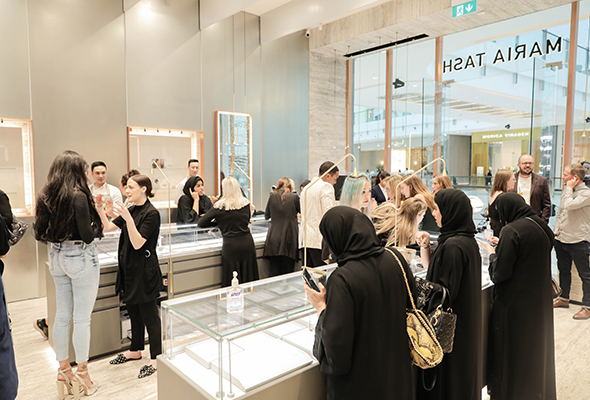 The fine jewellery designer and celebrity piercing expert has announced the opening of a new store in The Dubai Mall’s Fashion Avenue. Maria Tash Dubai is the Middle East’s first luxury piercing destination in a permanent location (she’s previously hosted a couple of pop-up stores around town), featuring four custom piercing rooms and a VIP lounge, spanning over 2100 square feet. “I’m delighted to bring my designs and expertise to Dubai, which is an exciting luxury destination with an outstanding global reputation. Working with clients from many countries in the Middle East has been a source of inspiration, and has allowed me to grow as a jewelry designer. I am very excited to be opening a flagship in the heart of the region, surrounded by its gorgeous architecture, at the new Fashion Avenue extension within The Dubai Mall,” says Maria Tash. Maria Tash is widely regarded as the pioneer of the modern movement around designing and curating elegant fine jewellery for piercings. She has developed a technique through which each client’s personal style, complexion, and anatomy guide a bespoke combination of studs and rings, combined to best flatter the wearer’s ears. She’s got a cult following of celebrity & industry fans, too, such as Gwyneth Paltrow, Kate Moss, and even Queen Rania of Jordan. Maria Tash is located on the First Floor of Fashion Avenue at The Dubai Mall and piercing services are now available, starting at Dhs110 per ear lobe. Click here to make an appointment.